Still have a copy? That could've been used as evidence to lock you both up! I'd like to forget that one ever happened. Ok, ok. The Rick post wasn't that entertaining. But I think you've been possessed by a sarcasm-demon Rick. A tough one to get rid of. Even Jesus might break out into a sweat treating that. Got time for an (experimental) exorcism ? ***. *** Warning:- may cause good, Christian behavior, perfection, bliss and constant contact with God the Father. On the down side, there is a small (only small) chance of complete loss of brain functioning. Well, it was entertaining from a sarcasm POV. But not from the "even while offending hundreds" POV. I'm not backsliding, it's the moonwalk. Here it is. 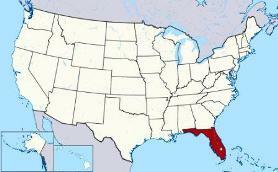 FL is in the southeast United States. I understand that Florida is not the center of the universe, but a simple google search would've shown you where FL is. Does Slobovia* not have the google function on computers? *Slobovia. I wonder who used to call it that. I kept in contact with him for a long time after he left but have since stopped. They will probably both be retired and travelling the world.. I must've missed that one! Where was I? Rick probably knows where you were. He likes to stalk people.